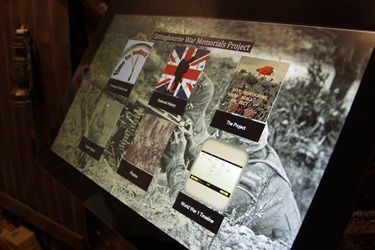 Yesterday the Mayor of Swale, Cllr George Bobbin officially unveiled a touch screen display which aims to capture a digital Roll of Honour of local men who fought in the First World War. The Historical Research Group of Sittingbourne, who are behind the venture received £5,200 from the Heritage Lottery Fund (HLF) for the Sittingbourne War Memorials Project. Awarded through the Heritage Lottery Fund's First World War: then and now programme. To mark the Centenary of the First World War, the project will enable local people in the Sittingbourne and surrounding areas to come together to preserve the memories and heritage of the people who lived through the First World War. Volunteers will collect photographs, newspaper clippings, documents, letters and photos of keepsakes, as well as family tales passed down to help them build a clear picture of what life was really like. Training and guidance in preparation of presentations and how to conserve and record documents, photographs and other items will be available throughout the duration of the project. With help from our researchers, the information gathered will be digitally recorded and an interactive archive will be created where everyone can access and contribute information. The archive will encourage the public to discuss, contribute, share and research information about the relatives in their own families and discover the significant part that Sittingbourne and the surrounding villages played during the First World War. If you would like to become involved or find out more, please contact Richard at ww1@hrgs.co.uk or call 07778 793079 or visit us at Unit 17, The Heritage Hub, The Forum, Sittingbourne ME10 3DL. Open Wednesdays to Saturdays 10am to 4pm. The Historical Research Group said that they are also indebted to other organisation for their financial support which helped to make this exhibition possible, these include: Kent County Council, Swale Borough Council, Sittingbourne Society (John Jordan bequest), Rotary Club of Sittingbourne Invicta Branch, some private individual donations, and also to Tesco Stores Ltd for the lease of the unit. Richard Emmett, chair of The Historical Research Group of Sittingbourne also wanted to thank the University for the Creative Arts for supplying the very impressive trench backdrop that occupies an entire wall of the display and also for the Cenotaph displayed in the window. Both these items were formally on display at the Rochester Guildhall Museum.